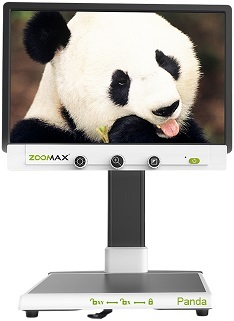 The New Panda Desktop Magnifier has only 3 big, intuitive buttons and are designed for 3 frequently used functions; magnification, color mode and brightness adjustment. So no matter who uses it, grandparents or young children, from the very beginning the easily used controls allow for quick and useful access to reading material or photos. There is no training necessary, immediately become more independent and enjoy reading once again. High contrast black and white appearance, especially the control panel is straightforward for visual impaired users to reach and operate in different positions and environments. Especially designed for simplicity and convenience, the Panda has no redundant decoration and is ready to use right out of the box. According to the research and feedback from many end-users, desktop magnifiers a with 19" screen and 19.5" XY table is a more desirable choice to view pictures or read full page documents. The Panda ideal for reading and offers a clear image, but occupies less space. The Panda is absolutely the best priced unit in its class and offers excellent features. It is designed for most visual impaired people to easily read books, do housework, deal with documents and tend to daily tasks.